For those of you who don’t speak Dutch that means Queen’s Day. Queen’s Day is a national holiday celebrated in the Netherlands and that meant I didn’t have classes. It’s celebrated April 30 every year (unless it falls on a Sunday) and it’s to celebrate the Queen’s birthday, but not the current Queen Beatrix’s. Queen Beatrix’s birthday is in January; Koninginnedag is meant to celebrate her mother’s birthday, Queen Juliana. At first, I was a bit weary at the thought of celebrating Queen’s Day because it sounded like there would be a massive amount of people dressed in orange stuffed in the trains on the way to and from Amsterdam, kind of like Carnival, but this time everyone would be wearing the same color and instead of going to Maastricht, people would be going to Amsterdam. After hearing several exaggerated stories, I was pleasantly surprised at how tame things were in Maastricht. It was shocking that not a lot of people were wearing orange, but it’s always nice to see how supportive Dutch people are of their national holidays. 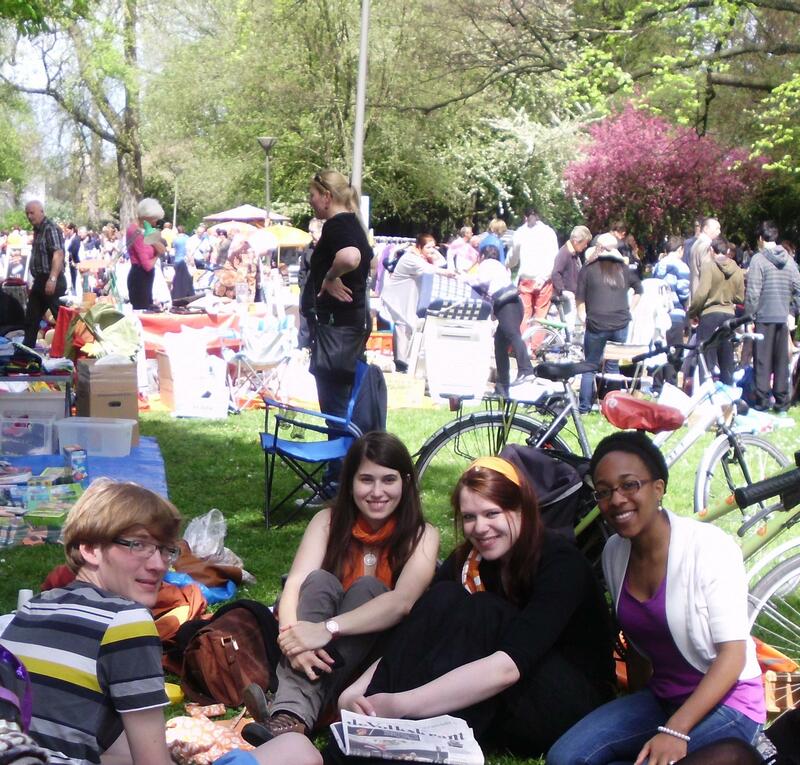 The day was nice (about 65 degrees and sunny) and the majority of people convened in the park for the vrijmarkt. Luckily, I’ve become quite fluent in Dutch and can tell you that vrijmarkt is a flea market. It was the biggest flea market I had ever seen in my life. People apparently got there around 7 a.m. to get a good spot to sell their things. There was something for everyone. You could literally buy anything and everything there. People were everywhere! It was a lot of fun. My friends and I walked around for a while before sitting down and relaxing with some of our other friends who were selling things. According to my Dutch friend, the flea market is such a big deal since there are very strict laws about selling things in the Netherlands. The laws are quite simple and straightforward: you can’t sell anything anywhere without a permit (and yes, that means you couldn’t have a yard sale at your home either). Koninginnedag is the only day that people are allowed to sell things without a permit, hence the large crowd of sellers. It was a nice breath of fresh air from my daily routine and it was definitely nice to relax and learn a little bit more about the history of the country I now call home. This entry was posted on Thursday, May 3rd, 2012 at 9:58 am and is filed under Spring 2012, Whitney in The Netherlands. You can follow any responses to this entry through the RSS 2.0 feed. You can leave a response, or trackback from your own site.